In the Fortress of Solitude, the heroes form a plan. If they're going to strike back at the villains, the need armor that will shield them from Brainiac's microscopic drones. As they begin work on the armor, a separate strike force is sent in against the villains. Zatanna teleports the band of heroes into Grodd's lair, but they are segmented almost immediately as Captain Marvel is drawn away by Black Adam threatening Mary Marvel. As he rushes outside to save his sister, he sudden finds Mary and Captain Marvel Junior turning on him. Inside, the heroes are shocked to discover that Grodd has been given a yellow power ring. High above the ground, Mary ceases her attack and transforms back into a human. As she falls to the ground, Black Adam and CMJ prevent Captain Marvel from rescuing her. In Gotham, Bruce Wayne takes Clark Kent to Leslie's orphanage to investigate the miraculous healing of the reformed Scarecrow. Clark uses his vision on a formerly-paralyzed boy, only to discover that Brainiac is making them into some form of organic machine like him. Captain Marvel breaks free and rushes to save his sister, but as soon as he saves her she transforms back into Mary Marvel and attacks him. Brainiac takes control of Captain Marvel. Inside, Red Tornado attacks Grodd as Metamorpho transforms into a gas and infiltrates the gorilla. Sinestro comes to save Grodd from their assault, but not before Metamorpho retrieves Grodd's power ring. Outside the Fortress of Solitude, the possessed Captain Marvel begins to try to break in. Superman goes to meet him and the two battle across the arctic. Green Lantern finally appears and cleanses Captain Marvel. The heroes assemble in the Fortress and don their new armor for the fight. As the heroes fly to battle, Luthor teleports to Captain Cold and rescues him, telling him that everything is going well. Story - 4: This is one of the best Justice League stories I've read in a long time. I still love it, but lately I've really been getting the feeling that the entire issue is just exposition, with a fight or two thrown in to keep it interesting. Decompression would be the common term. And I'm torn, because it's not necessarily a bad thing. I would rather have Justice be a little too long, rather than trying to cram it into seven issues (like, say, Infinite Crisis). But full pages of Dr. Magnus talking just get a little boring after a while. That complaint aside, this was still a very satisfying issue. Ross' love of Captain Marvel still shows up, but not so excessively that it affected the story. Grodd with a lantern ring was fantastic, but the real gem in this issue is the armoring of the heroes. I know it just reeks of an action figure moment (just wait, they'll be in stores before you know it), but it was still great in a geeky, fanboy sort of way. Art - 5: More of the same here. Braithwaite's pencils continue to add a lot to Ross' work. Just for fun I pulled out Kingdom Come and compared the Superman/Marvel fight in that to the brief conflict that happens in this issue. Both are great, but the work in Justice is much more dynamic. The splash of Superman and Captain Marvel actually looks like they're hitting each other. Speaking of splashes, this issue had some great ones. Green Lantern's powers lend themselves very well to a painted book, and the splash of Grodd's ring versus Hal's is gorgeous. And finally, I know I already said how great the armored scene is, but it's really Ross' work that makes it so great. 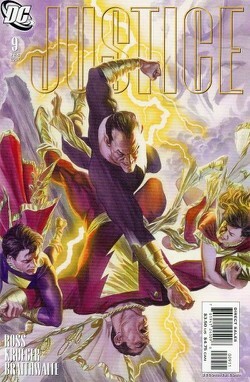 Cover Art - 5: This is easily my second-favorite cover of the series, following only the Superman cover from issue four. It's a very simply concept, but I just really like the image of Captain Marvel being beaten by the rest of the Marvel family. It's got some very nice lighting effects, a decent (if non-descript) background, and Ross' Black Adam looks fantastically evil. The only part that could have been better is a more exciting background, but I can't really complain about clouds when four flying people are fighting.